A growing world population has led to rising demand for fresh water to ensure a growing supply of food and to meet rising nutrition demands. Where will this water come from? A new publication co-sponsored by CGIAR sheds some light on the narrowing options. Sudhirendar Sharma reviews the report. Imagine a canal 10 meters deep, 100 meters wide, and 7.1 million kilometers long - long enough to encircle the globe 180 times. That is the amount of water it takes each year to produce food for today's 6.5 billion people. The projected increase of between 2 and 3 billion people over the next four decades would mean increasing the length of this canal by another few million kilometers to everyone fed. Even if there were resources and technology to do this - and that is itself debatable - it's unlikely that there would be sufficient fresh water to fill this extended canal. This startling revelation comes courtesy the Comprehensive Assessment of Water Management in Agriculture (CA), an ambitious program co-sponsored by the Consultative Group on International Agriculture Research (CGIAR) that pulled together the work of 700 experts over a five year period. The program took stock of the past 50 years of water development to determine what future actions would be needed for the next 50 years. 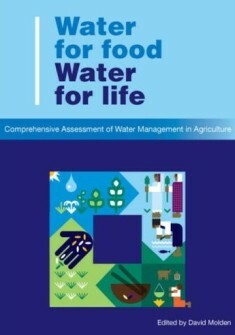 Packaged in some 700 pages, the voluminous report titled Water for food, Water for life (Earthscan, 2007) presents a careful mix of the good and bad news. First, the bad news. Fresh water usage from existing river basins has already been stretched to the limits, with no possibility of more of it being available to produce the additional food the world may need over the next decades. This future scenario looks gloomy when one takes into account that 850 million people, over 50 per cent of them living in South Asia, are food insecure even at the current levels of food production; raising their consumption levels would itself entail considerable additional need for fresh water. But there is some good news as well - producing additional food would be possible if hitherto neglected rainfed areas could be better tapped, and if greater focus is turned on low-yielding lands. Though the report avoids getting into the political dimension of food access and distribution, it throws words of caution around inter-basin water transfers (like India's proposed river-linking project) as well as expansion of hydraulic infrastructure to increase irrigation coverage. Instead, the CA findings contend that the world's food needs over the next few decades could be met by bringing the production levels of the world's low-yield farmers up to 80 per cent of what high-yield farmers get from comparable land. In effect, it calls for rainwater harvesting through effective watershed management to achieve this goal. While food imports can help overcome some water shortages, this does imply that water-scarce countries will inevitably yield some of their food sovereignty in the process. However, the situation on the ground is very different. Simply put, policy impetus for watershed management hasn't translated into effective results during the last three decades. A case in point is the finding of the Parthasarathy Committee, constituted by India's Ministry of Rural Development. The committee's report, released in January 2006, concluded that "... watershed programs have been bureaucratically driven and mechanically implemented with focus on 'outlays rather than outcomes' and 'accounting rather than accountability'." The Food & Agriculture Organisation, in its recent regional assessments of watershed programs, argues that many watershed programs suffer from inherent inertia to transform the rainfed areas. Nonetheless, the authors of the Comprehensive Assessment are convinced that options to increase future food production are indeed limited. With as much as 2700 cubic kilometers of green water (from rivers and subsurface), an estimated 70 per cent of the total, already withdrawn for irrigation, the focus must shift towards productive use of blue water (rainfall). Else, countries will have to depend on food imports. Egypt imported 8 million metric tones of food grains from the United States in 2000, and saved 8.5 million cubic meters of water in the process. While such substitution works well in purely market terms, it does imply that water-scarce countries will inevitably yield some of their food sovereignty in the process - a decision not all governments would be willing to make. Meeting increasing food demand from available green and blue water is only part of the story. The other part relates to meeting the nutritional needs of a large population whose dietary habits are changing. In India, as in China, rapid economic growth has quadrupled the consumption of meat, milk and eggs. This would mean more water for keeping pace with these changing dietary habits. While an average vegetarian person's dietary need takes about 3000 litres of water converted from liquid to vapour, a meat consuming person may need four times more water. Pushing vegetarianism at the cost of religious and cultural sentiments favouring non-vegetarianism will be daunting for many water-scarce countries. The question of dietary choices does, however, is not to be set aside too quickly. With one in every three persons suffering from water scarcity across the world and with irrigated agriculture being the major consumer of water, at least a few thinkers have asked if the focus should not shift towards educating consumers for making informed dietary choices. Anders Berntell, head of the Stockholm International Water Institute (SIWI), has suggested that "some kind of labeling of food products when it comes to their water requirements could be a first step." With labels, "if there is a choice between red meat or a fish [partly based on the need for water to cook it] then one could make a more enlightened choice." Certainly, if consumers were to demand a low-water-consuming diet, inefficient irrigation will come under the scanner! Such radical steps may become necessary, to reduce the acreage under irrigated agriculture in the not-too-distant future. In a market-driven world, researchers may need to apply market principles in making sense of the scientific evidence. A higher price tag for food with a higher water label would be a perfect disincentive for consumer as well as its producer. Given its multi-national authorship, the report stops short of making controversial recommendations but leaves readers with lot to read between the lines for interpretation. If a kilo of grain requires anywhere between 500 and 4,000 litres, should grain production be a priority for the arid regions? Does it not warrant a dramatic turnabout in the agriculture research agendas of national agriculture research systems as well as that of the CGIAR's international research centers? It cannot be denied that the most significant impact of research by the CGIAR institutes across the world has been on increasing acreage under high water-consuming crops like rice and wheat. Not only have the national agriculture research systems followed this blindfolded, this has been done at the cost of minor crops suited to diverse eco-systems and local livelihoods. After having overtaxed farmland across the world, the researchers are now beginning to see the reality. Dr. Robert Zeigler, a 56-year-old American who is director general of the International Rice Research Institute at Manila, has been quoted as saying: "If we don't take a hard look at that, who the hell will?" Some of the institute's recent advances already are being tested in Punjab, including one strain of rice that grows in dry dirt. But the scientists readily acknowledge that finding a breakthrough is an uphill task. Interestingly, at a time when genetically engineered crops are being touted as the answer to foot shortages and nutritional deficiencies, the Comprehensive Assessment cautions scientists to avoid taking the genetic route to crop improvement, as genetic improvements in plants can provide only moderate gains over the next 15-20 years. In many ways, this report is a timely assessment of global water resources from the standpoint of food security, poverty reduction and livelihoods generation. While the report makes a series of policy recommendations - from increasing water productivity to improving water rights and allocation - it restricts its assessment to the quantity-productivity discourse only. In doing so, the report not only underplays factors like climate change and global trade inequities but bypasses the political economy of investment in water infrastructure as a significant countervailing force. With external factors playing heavy on water governance within the nation-state context, pulling millions out of food and nutritional insecurity may remain daunting.